Your kid's birthday is coming up, and you're already busy, right? Well, hopefully these free birthday invitations will make all that planning and needing-to-do-this-and-that a bit easier. All you need to do here is to choose the one you like, download it and print it. 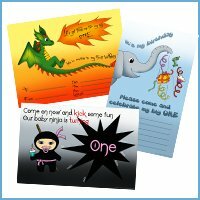 Here on this website you'll find loads of free birthday party invitations for kids that I have drawn and made myself. 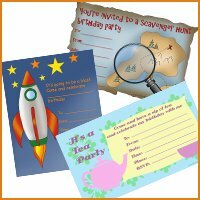 And if those invites that you find on this page aren't just right, please dive into one of my other printable birthday party invitations pages to see if you aren't lucky to find just the theme you are looking for. 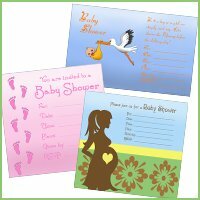 Also when printing these invitations you don't have to worry about the size or quality. They all have very high print quality (300 dpi) and a perfect card size (app. 10 cm x 15 cm). Please also note, that these free birthday invitations here are for private use only. Thank you. Does your little girl have a thing for pink, dancing and music? Then perhaps this theme choice is just the thing. You can prepare lots of dance games and even inspire everybody to dress up as ballerinas. 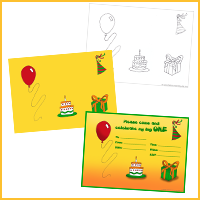 The size of this one of free birthday invitations is 15 cm x 9,05 cm in high 300 dpi resolution ideal for print. If you're kid is into animals like mine was, setting an African Safari theme might be a brilliant idea and there are plenty of ways to get that jungle feel right into your home. Maybe you can borrow lots of plants, sprinkle with leaves, put on some ambient animal sounds on the stereo - there are lots of cheap ways to get the atmosphere all wild and 'jungly'. 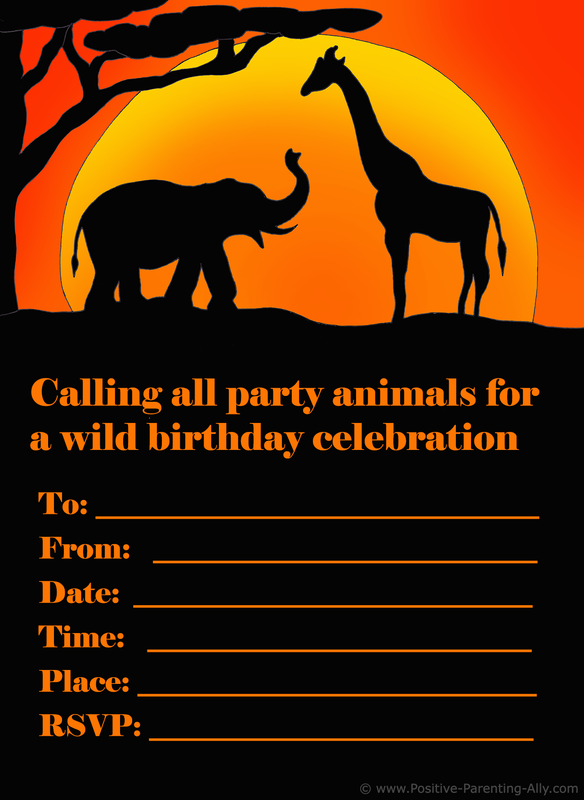 The image size on this jungle / savanna birthday invitation is 15,05 cm x 11 cm in 300 dpi. Rather than suffering in the heat of a summer party, you may want to cool things down with a nice ice cream themed party. There aren't as many decorations as you might want, but there are enough to give your home a festive touch. You can serve ice cream cake, fried ice cream, banana splits, and sundaes, which you can bet your guests will love - adults included. 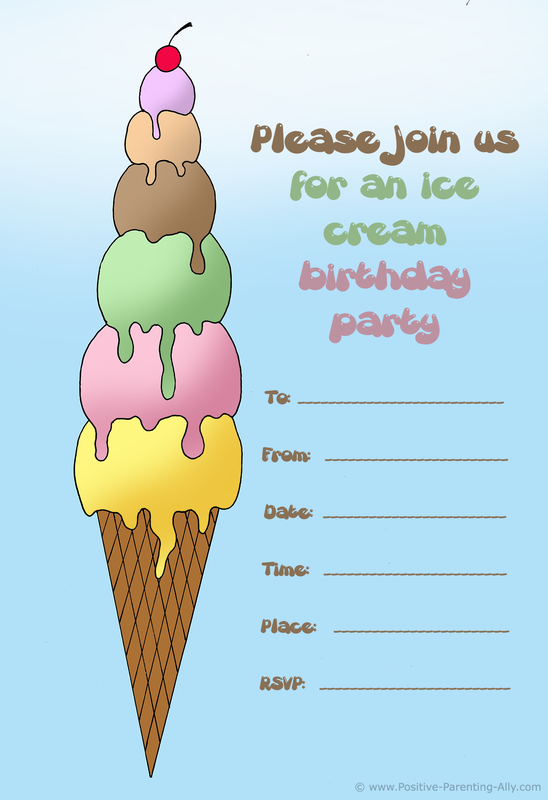 Just grab this ice cream motif for the birthday party invites and you'll be well underway! This cute ice cream invite size is 15 cm x 10,27 cm in 300 dpi. Does your little boy have a thing for soldiers and being strong and tough, then maybe a fun, innocent little army theme might make his day. You can do lots of fun birthday games that inspire coorporation and trusting each other - like soldiers have to do when being in a group. After it says "Please Report for Duty to" you simply write your kid's name. Other than that it should be pretty easy to fill out. 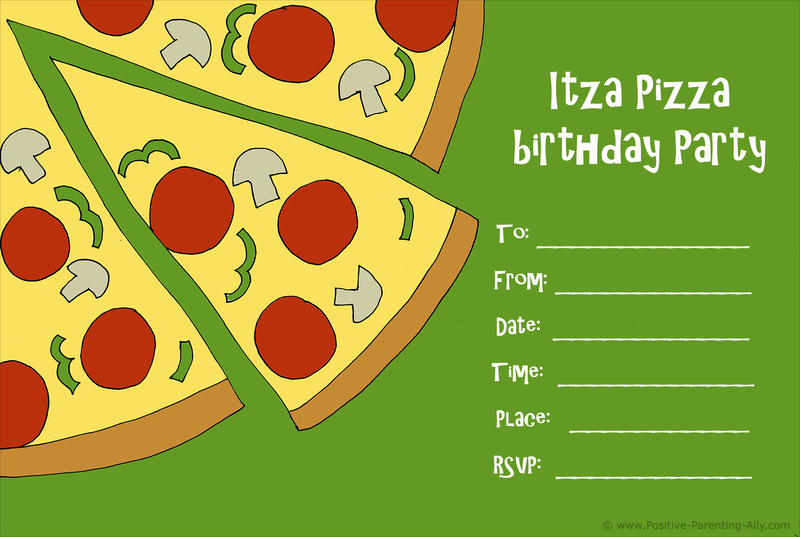 The size of this one of free birthday invitations is 15 cm x 10,53 in 300 dpi. 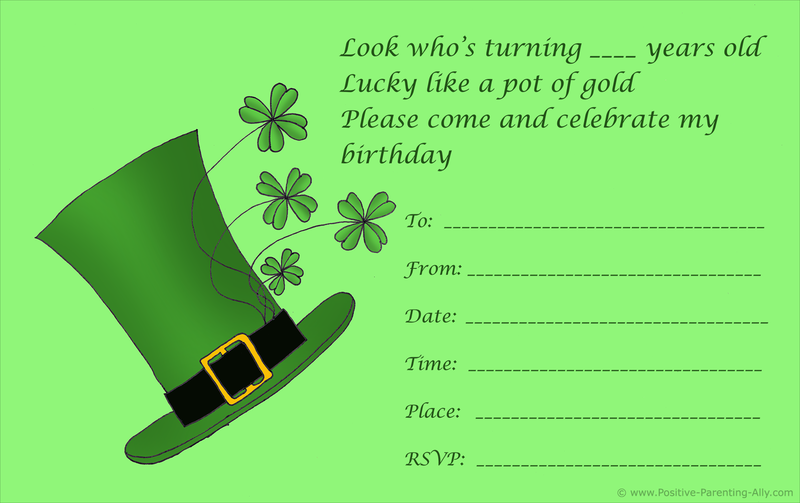 If your little one has Irish roots or their birthday is near St. Paddy's Day, it will be an excellent theme. You can just have all of the guests come wearing at least one item of green, and you can serve green soda, green juice, a green cake in the shape of a four leaf clover. If in doubt, after it says "Look who's turning" you merely write the age of the birthday child. 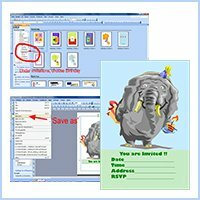 The size of this printable kids invitation is 15 cm x 9,43 cm in a high 300 dpi resolution. Do you have a little superhero geek still lift inside? 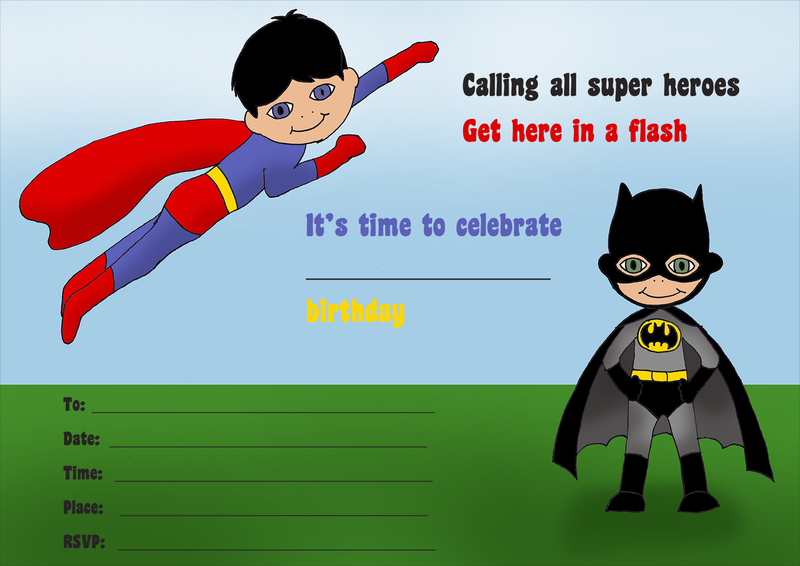 Then throwing a superhero birthday party for your kid (if he or she is into to it too of course) is a great way to finally let that forgotten inner hero loose. You can invite all of the kids to come to your "Hall of Justice" or the "Avengers Mansion" in your home, and you can serve fun snacks on DC or Marvel comic character-themed party supplies. After it says, "Calling all superheroes. Get here in a flash. It's time to celebrate" you write the name of your kids. And then proceed to fill out the rest. Simple and easy, right? The invitation size is 15 cm x 10,61 cm in high print quality, 300 dpi, all ready to download and print. For those who like to get a bit creative with their hands, an arts and crafts theme is one of the best choices for you. The ideas for what to do with such a theme are near endless. E.g. you can have all of your kids get down and dirty with some hand and finger paints, you can have a paper tablecloth that the kids can draw on, you can buy canvasses pretty cheap nowadays and let each child have his or her own canvas and inspire them pretend to be a big, famous painter whose style they should copy etc. Just make sure that the paint is non-toxic and that you have plenty of aprons handy to prevent the mess from getting onto the clothes. 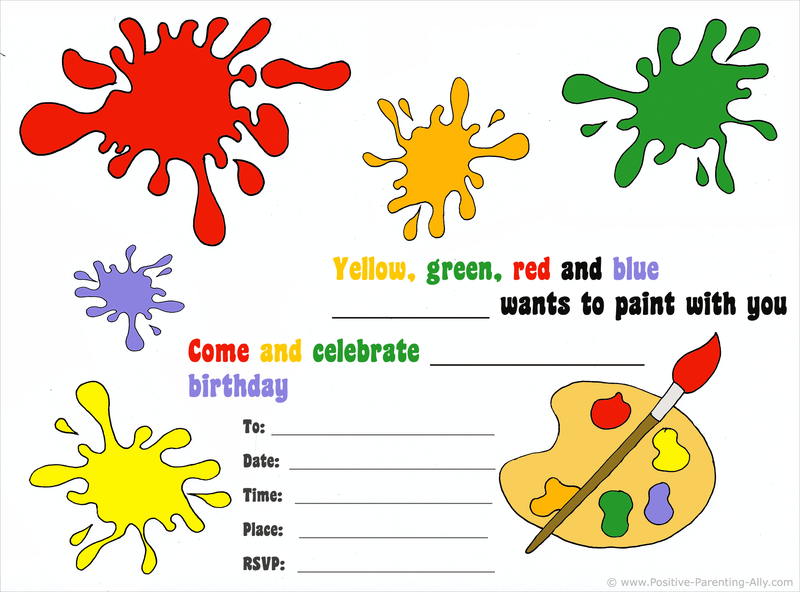 This birthday invite with colorful splashes of paint has a printable image size of 15 cm x 11,11 cm in 300 dpi. When filling out and personalizing the invite, you need to write your kid's name after "Yellow, green, red and blue" and after "Come and celebrate" you need to write your kid's name again along with how old he will become. 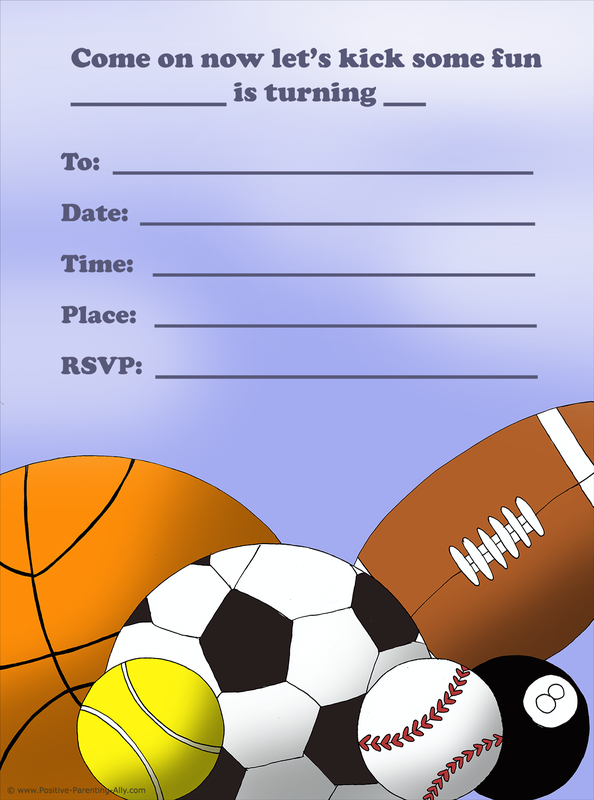 Little boys may not yet love sports as much as their Daddy does, but it can be a fun theme for a primarily boys party. The little men will be able to dress up in the colors of Daddy's favorite basketball, hockey, football, or baseball team, and all of the decorations can be sports oriented. After it says, "Come on now let's kick some fun" you write the name of your child. And after "is turning" you write the age. Obviously if your child is turning one, it will rhyme too. 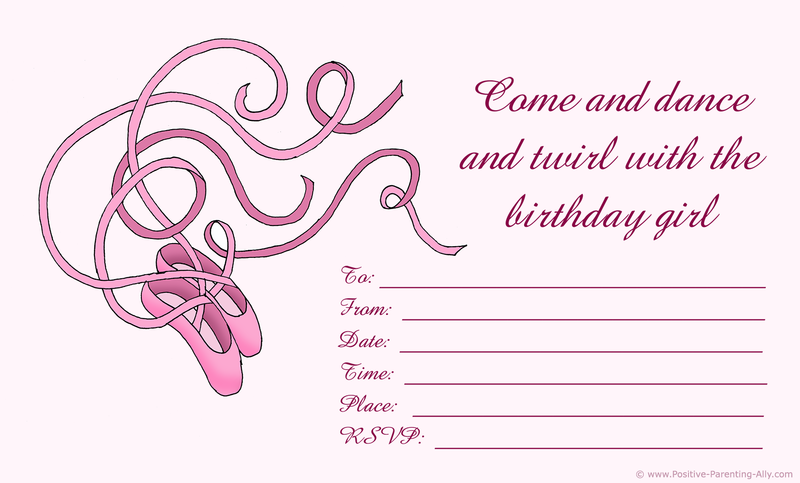 The size of this one of free birthday invitations is 15 cm x 11,14 cm in 300 dpi. 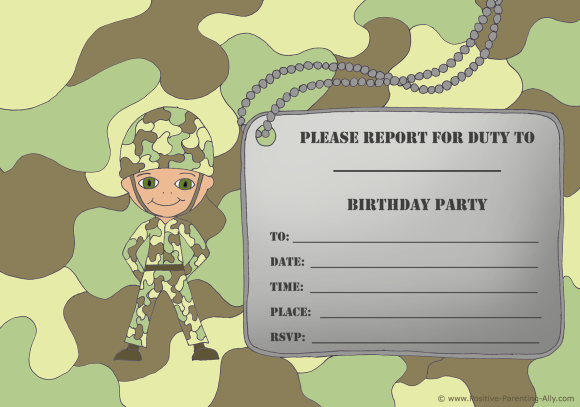 There are many ways to do the theme around this cute birthday invite. For instance the little boys and little girls at this party can come dressed up, with the boys dressed as bees and the girls as flowers. You can use all kinds of decorations involving both bees and flowers. 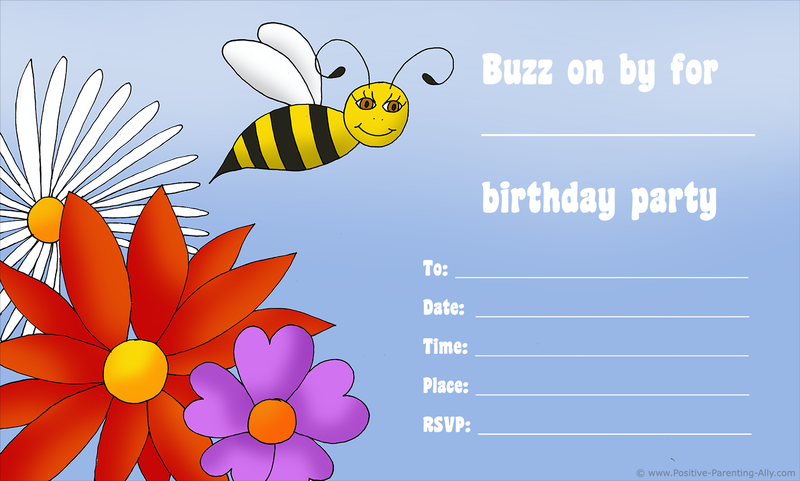 After it says, "Buzz on by for", you simply write the name of the birthday kid. Other than that, the instructions should be understandable. The size of this high resolution printable birthday invite is 17 cm x 10,22 cm in 300 dpi. Some kids love seeing monsters, and it can be a good choice for a Halloween-style party to have the kids dress up. You can use Halloween themed decorations. 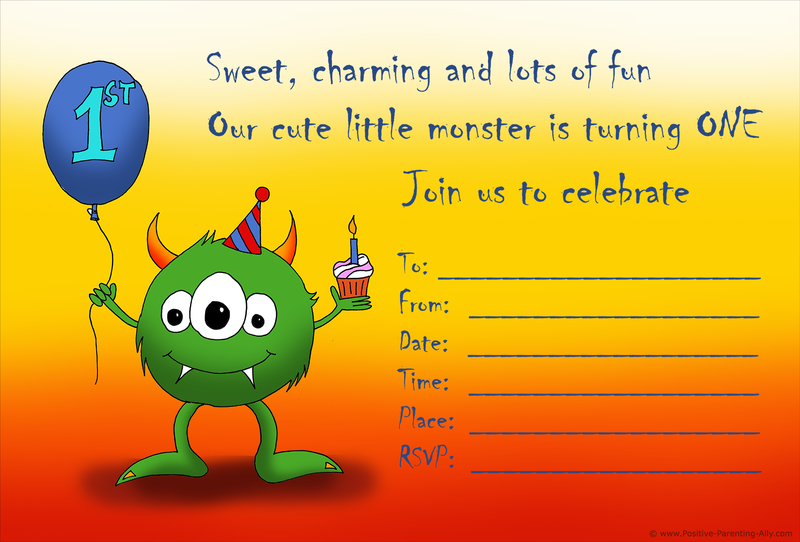 The free printable invitation below, however, is more cute than scary. In the first blank spot right after "Come and celebrate. Our little monster" you write the name of your kid. After "is turning" you write his/her birthday age. The image size is 15 cm x 11,15 cm in 300 dpi - ideal for print. 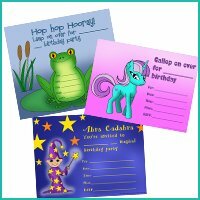 Magic is something that all kids will love, and you can use it as the theme for your party. If you want to do some easy magic tricks in front of the kids, you can go to this page of mine to get inspired. If you have a bit of money to spend, you can even have magician come and entertain. After is says, "Abracadabra. 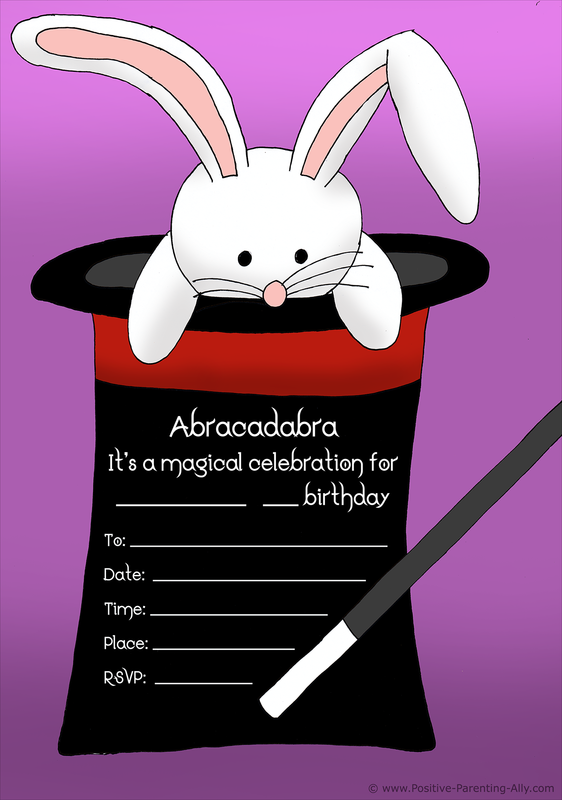 It's a magical celebration for" you simply write the name of the birthday child and his or her upcoming birthday age. Printable size is 15 cm x 10,55 in a high 300 dpi resolution. Little boys love speeding around in their push cars, and they probably dream of the day when they will ride a real car. A great idea for a birthday party will thus be cars and trucks, and there are movies like Cars that will make it easier for you to come up with easy décor ideas. 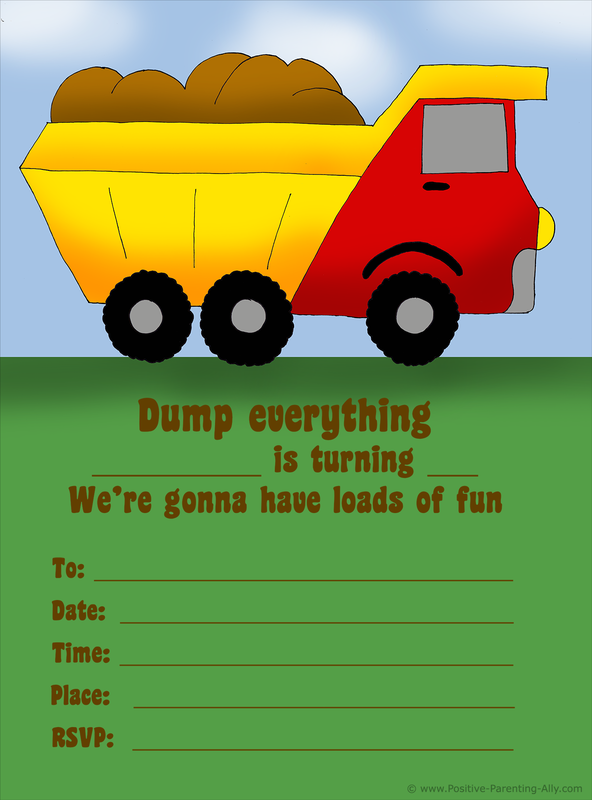 If this is something your kid will love, just print out the truck birthday invitation below. All you need to do here is filling out the blank spots once you've printed the invite. After it says, "Dump everything", you write the name of your kid. And after "is turning" you write the birthday age. Everything else should be pretty simple. 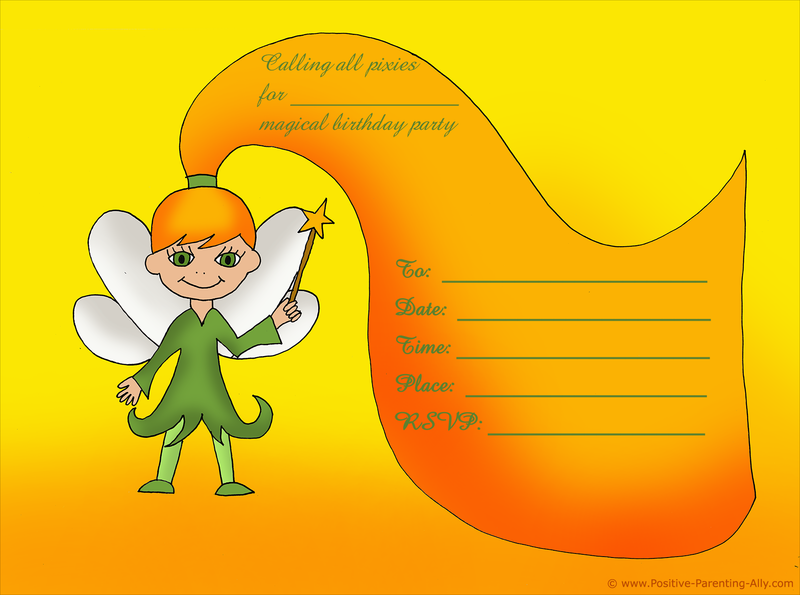 The image size of this printable birthday invitation is 15 cm x 11,1 cm in 300 dpi. An excellent theme for parties for little girls is a fairy party, especially if your little girl likes watching the Tinker Bell series of animated films made by Disney. To get that fairy feel into your living room you can maybe spread some flowers on the table, but if the weather is nice you can all sit on the grass in the garden close to the fairies homes. After it says, "Calling all pixies" you write the name of the birthday child. This birthday invitation size is 15 cm x 11,15 cm in 300 dpi. There's nothing like a good slice of pizza to take the edge off your hunger, and you may find that doing a pizza-themed party is a great way to go. Not only is the food fairly easy to make yourself (e.g. you can do a large pizza in the oven or small round hand-sized pizzas), but nearly all kids love a good tasty slice of pizza. You can also have pizza making be part of the event itself, and have the kids decorate their own slices of pizza. In my experience kids can have so much fun doing their own pizza. High resolution in 300 dpi, ready to print image size of 15 cm x 10,07 cm. 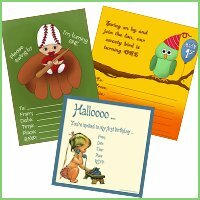 I hope you found something you could use among these 14 printable and free birthday invitations. I sure did enjoy making them.